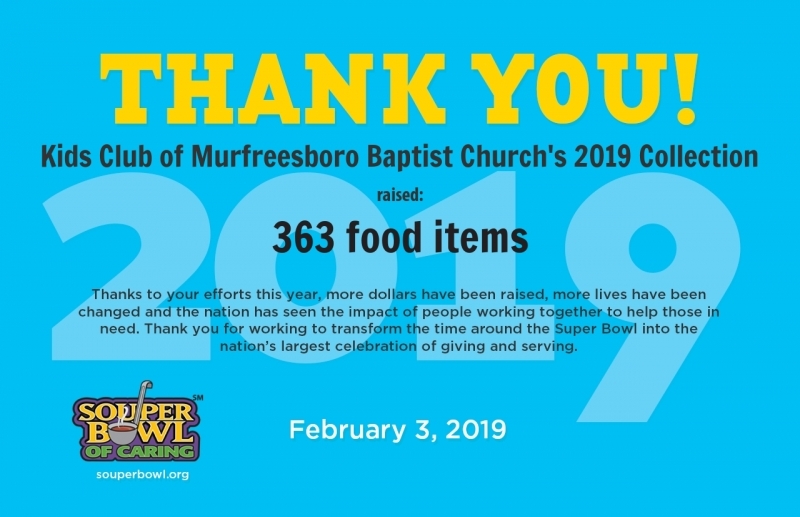 Kids' Club challenged the congregation of Murfreesboro Baptist Church to bring a can or cans of soup on Super Bowl Sunday. For the third consecutive year, we participated in Souper Bowl of Caring, a national event to raise awareness for hungry Americans. In 2016, we collected 111 cans. In 2017, we collected 126 cans, and in 2018, we collected 198 cans. In 2019, we collected 363 cans. The cans of soup are added to the church food pantry.